There are so many styles of architecture and home décor out there, and we frequently come across blends of an old style enhanced by something new; the rustic teamed with the urban, or the traditional offset by the modern. However, the delightful house that we are going to tour today has no blends – it is a pure modern beauty with no trace of the traditional or the vintage. The designs, materials, textures and lights will be a visual treat for an enthusiast of contemporary style! 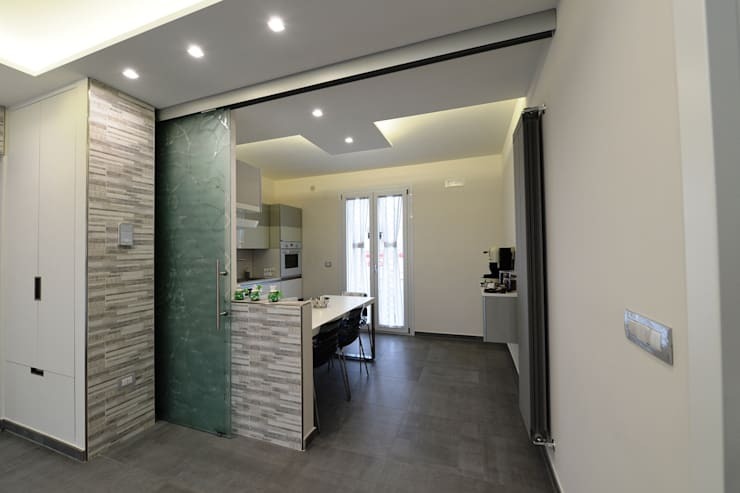 So let’s have a look at this small but spectacular modern creation by restoration and renovation professionals at YesHome in Nola, Italy. The seamless harmony of clean lines, neutral colours and stylish materials makes this a fine example of a contemporary living room. The colour palette is sophisticated, and the sleek white coffee table stands out like a modern work of art. 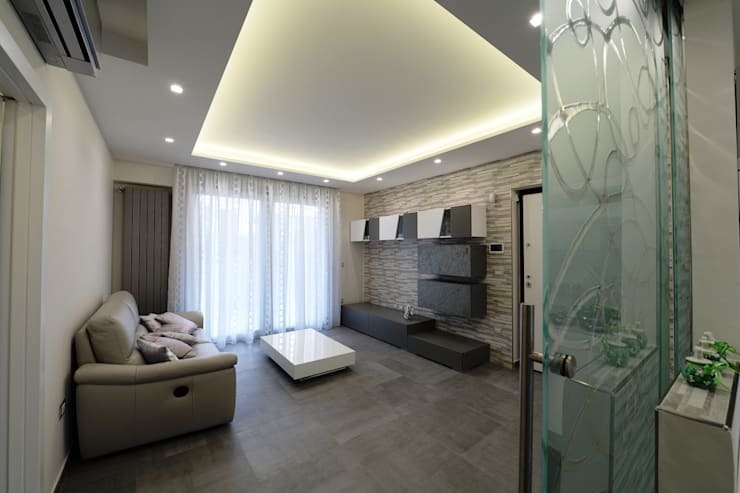 The recessed track lights and spotlights further enhance the appeal of this space, while the most eye-catching feature is the textured wall opposite the comfortable sofa. The kitchen décor is elegant, minimalist and functional. The smooth modern cabinets above and below are embellished with trendy appliances in the middle. The sleek white dining table and designer black chairs are a simple and classy touch. 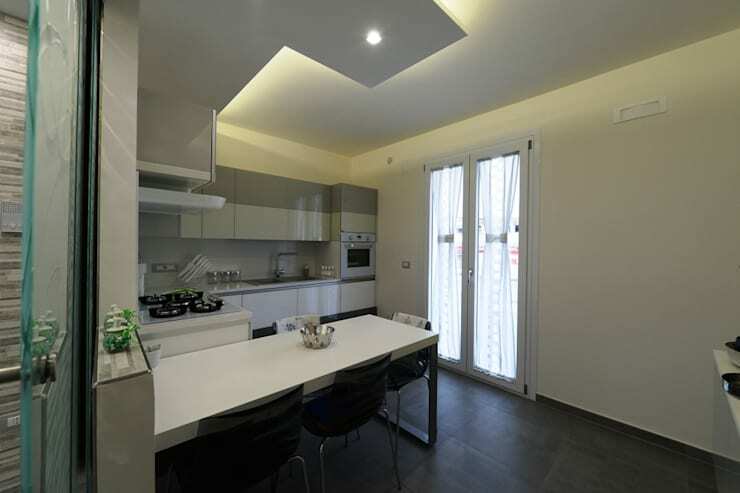 One of the most stunning features in this lovely apartment is the sliding door between the living room and the kitchen. This elegant door is made of a beautiful panel of decorative glass – what a glamorous way to connect the two spaces! Who'd ever want to stop showering here? 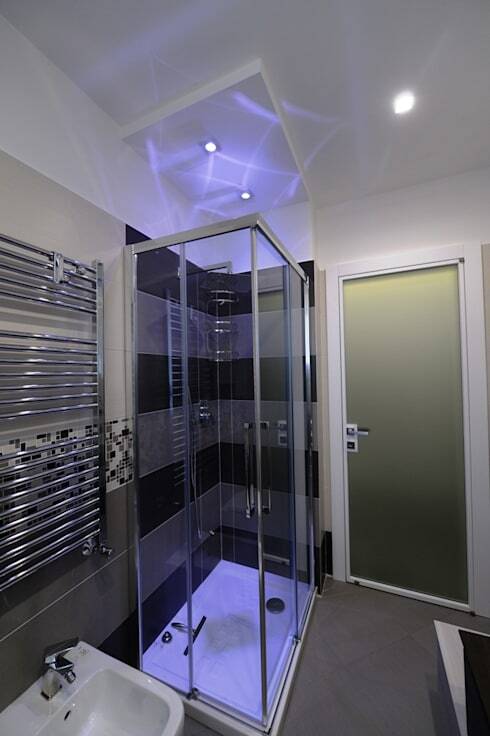 The elegant glass shower cubicle is illuminated by blue spotlights overhead! We love this funky touch. The rest of the bathroom continues the white, grey and black colour theme of the living spaces, as well as the uber-stylish tone set by the glass shower cubicle. The fittings are sleek, while the wooden washbasin cabinet is a clever idea to balance the cool décor with a warm note. The mosaic panel on the wall is an excellent addition as it gives a touch of liveliness to the sober décor. 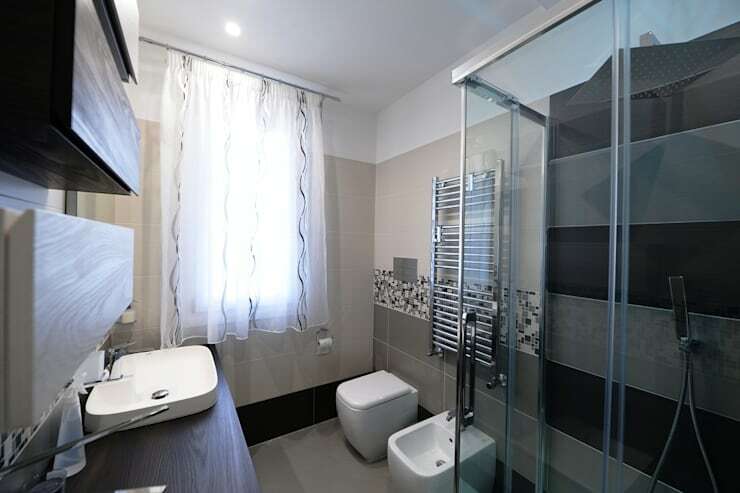 The second bathroom showcases a different kind of modern décor, treating us to a relaxed and cheerful ambience! Beautiful pink hues dominate the space, while the washbasin cabinet and fixtures have elegant curves instead of straight lines. 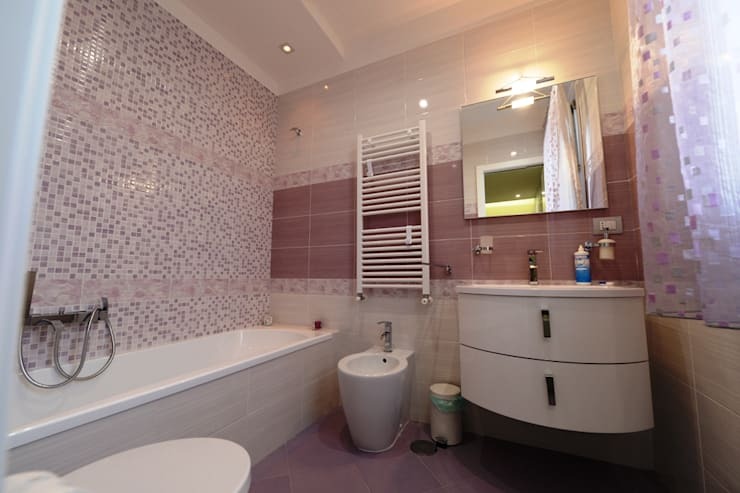 The mosaic wall is a lively addition to this pretty and stylish bathroom. What a gorgeous residence that exemplifies modern trends! The team at YesHome has selected a simple and stylish blend of colour and design, combining it with a few exquisite elements to make a beautiful apartment. Take a look at another home tour for more ideas: The coolest container house you'll ever see. Has this compact home given you some ideas for your own?